A bleaker price scenario looms, as the country is sure to miss its rice production target of 19.8 million metric tons (MT) this year due to devastation wrought by Typhoon Ompong, Agriculture Secretary Emmanuel Piñol said. 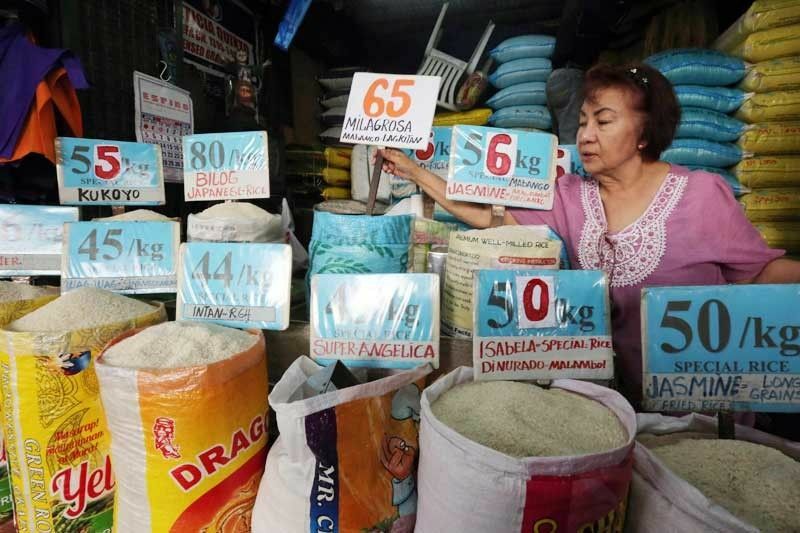 MANILA, Philippines — Despite the continuous arrival of rice imports, the price of the commodity – the main staple among Filipinos – continues its upswing, hitting its highest level this month, the Philippine Statistics Authority (PSA) said. A revised production target for the year is being readied. In its regular update on palay, rice and corn prices, PSA said the average wholesale price of well-milled rice rose 17 percent to P45.51 per kilogram during the second week of September versus a year ago. Its average retail price also increased to P48.93 per kilo, up by 16 percent year-on-year. Wholesale price of regular-milled rice was P43.13 per kilo, 21 percent higher than the previous year’s price. Its average retail price also increased 20 percent to P45.71 per kilo. The average price of palay went up to P23.04 per kg from P19.62 per kg last year. Week-on-week, prices were also up by 0.26 percent. State-run National Food Authority (NFA) earlier admitted the imports did little to lower the prices of rice. The country’s rice inventory continues to thin, reaching only 1.52 million MT in August, 25 percent lower than last year’s volume stock of 2.02 million MT. This was also 24 percent below the previous month’s stock level of 1.99 million MT. Before Ompong’s onslaught, the Department of Agriculture expected rice prices to stabilize in November. Some 250,000 MT of imports are expected in the fourth quarter while the main harvest season is seen to help augment national inventory. Next month, some 16 million bags (800,000 MT) of imported rice are arriving to boost local supply and bring down prices of the staple, Albay Rep. Joey Salceda revealed yesterday. He made the revelation in the course of budget debates and in answer to questions from his Albay colleague Edcel Lagman. “Buffer stocks (held by the NFA) are now about 100,000 metric tons (two million bags). These would be augmented by imports scheduled to arrive next month,” he said. He said delivery of the imported rice would be “calibrated” in a manner that would not adversely affect rice farmers who have started harvesting their crop. “It is now harvest season in Cagayan and Isabela, two of the biggest rice-producing provinces, while in Albay, harvest usually comes in October-November,” he said. Budget Secretary Benjamin Diokno earlier blamed last month’s 6.4-percent inflation, the highest level in 10 years, on NFA’s failure to bring in enough imported rice. Lagman asked Salceda, who is an economist, about the contribution of high prices of rice and fuel to inflation. Salceda said increased rice and fuel prices accounted for a significant part of the 6.4 percent inflation in August. To make sure every household gets enough supply of rice, the Department of Trade and Industry (DTI) yesterday signed a memorandum of agreement (MOA) with the NFA and the Philippine Amalgamated Supermarkets Association Inc. (PAG-ASA) on limiting the amount and volume of rice each consumer would be allowed to buy. Under the MOA signed by Trade Secretary Ramon Lopez, NFA deputy administrator Judy Carol Dansal and PAG-ASA president Steven Cua, participating supermarket outlets would be given NFA rice retailing license and would be selling the staple at mandated consumer price. In particular, each customer would be allowed to buy no more than two packs of two kilograms per pack of NFA rice. Cua said the group would still have to identify the supermarkets that would participate in the initiative. PAG-ASA currently has 40 members representing 160 outlets in the country, catering to the B, C and D markets. The MOA will be in force for one year from the date of signing and subject to renewal by the parties.